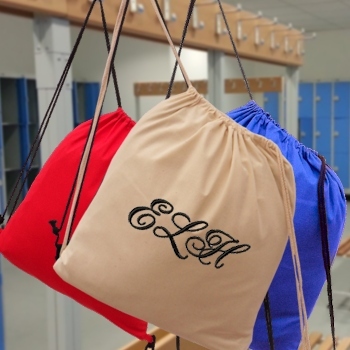 Sturdy cotton drawstring school PE, swim or gym sack. Natural cotton duffel bag with backpack style rope drawstrings, ideal for sports, school or sleepovers. The bag can be personalised with embroidery in your selection of letter font style and thread colour for the text. Sturdy cotton drawstring school PE, swim or gym sack. Natural cotton duffel bag with backpack style rope drawstrings, ideal for sports, school or sleepovers. The bag can be personalised with embroidery in your selection of letter font style and thread colour for the text. Enter a name, initials or numbers you want embroidered. Easy care natural cotton material design that can be machine washed. Size 37cm x 45cm.